There is lighting glass and then there is lighting glass. You wouldn’t think it would be that much of a challenge; throw some light on it and there you go, right? I suppose, for some things, a dash of light would be better than wasting away in a dull corner and getting no attention. Yes. I have been lighting glass in a variety of spaces over the years and there are some tips that I think will help when considering a new piece of glass or breathing new life into an older piece. 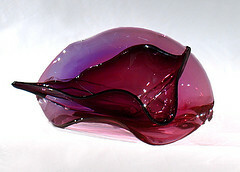 First, there are a range of different glass objects, all with different considerations. 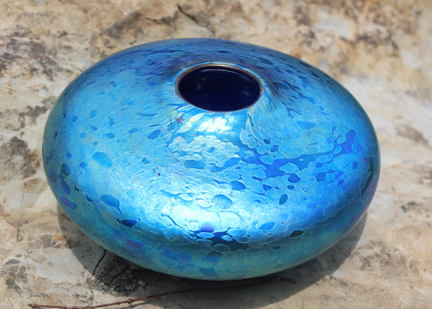 How you light a large solid piece will be different from a transparent bowl or vase, and this will also be different from an opaque work. The first consideration is where the object will be placed. Will it be against the wall in the case of a hanging piece like a sculptural platter or a work on a pedestal up against the wall? Will it be out in the middle of the room? Will it get natural light? Will it be high or low? First realize that glass eats light. The more light you give many glass pieces, the more brilliant they are. Mostly. But not all. There is such an incredible range of glass out there today and as a result a one-size fits all approach doesn’t always work. But for the sake of simplicity I am going to cover some basic issues and try to hit this with scatter-shot. I will say from the outset that, for me, there are two choices for lighting; halogen and daylight. In some cases I have used LED’s with a specific color range that is balanced for daylight, but for the most part, all other lighting options offer less than acceptable qualities. Incandescent floods often are very warm and this can shift blues and greens in slight ways to help keep them feeling quite as dreamy and brilliant. Fluorescent is just difficult because it is so diffuse. Good for fill, but bad for hitting glass with sharp points of light for great highlight effects. Yes, LED’s are now being made to fit halogen gimbals. I just don’t like them for most lighting due to its flicker rate and this also includes fluorescents. When I say “flicker rate” I mean that all LED’s and fluorescents are powered by electronics that control power and thus pulses the electricity through them. Wave your hand in front of a fluorescent or LED and you will know just what I mean. All of these are good on the pocketbook and help to keep down energy use, but until they make an LED that produces the SAME light as a halogen, I remain very much a halogen man and feel that you should too (and if you are a lady, be a halogen gal, ok?)! Having said that, LED’s CAN be a good light source for solid works lit from the bottom, such as how I light my Inscapes and Andromeda Geodes. If you have work that is colored but transparent and will be near a wall, my number one suggestion is to consider having that wall be as neutral a color as possible and if white is an option or a very pale gray, this will show off colored transparents the best. The white wall will act as a giant bounce panel for you and you will be able to shoot light onto the wall all in an effort to bounce light back through your cherished piece. If this is not an option, however, I suggest lighting directly from above or even from below (as in a lit pedestal–it’s actually a lot simpler than you might think; a tube with a sheet of frosted glass on top and an appropriately powered light kit in the base or just below the glass top). In the work that I do I intensify the color of tranparents by putting them against white backgrounds as I blow the piece. Without a bright background transparent colors will come across as dull and lifeless. If you just read this and your wall as a nice terracotta and you are feeling that lurching feeling in your belly, consider before grabbing the whale gray, just hang a white sheet on the wall to see how the piece is changed. You might then realize that the piece isn’t for THAT wall or space. Sometimes, though, by lighting straight down on a transparent piece, you can mitigate some of the surrounding color influences somewhat, so give it a try before giving up. Example of a backlit transparent piece. In this case, the wall was white so as not to interfere with the coloring in the piece. Opaques, by comparison, can most often be in almost any environment and show well. They will, though, be a lot flatter in dimension and subtlety as a general rule. In this case, it is more a consideration of placement and decor. Will it look good on that terracotta room, or would it benefit from being closer to the windows and a different color arrangement? But remember; please never become a slave to matching colors. Think coordinating and you will have just given yourself a lot more freedom and room to no longer match the sofa. But that’s not really about lighting is it? No. In the case of very thick glass (half an inch in thickness and up) or solid work, this is a whole other animal. Many pieces will be greatly enhanced by being lit from underneath, and the amount of light in a clear solid piece or a lightly colored work necessary to illuminate will likely surprise you. Depending on how large the piece is, the lighting requirements will go up with size. It is not at all unusual to need 200 watts of light to show off a very modestly size piece 6″ x 6″ in two dimensions. Before going very far into this I also need to mention one very good tool for helping you light work, and that is the halogen track light. These can be purchased at the hardware store with plugs and, with a couple of them, you can move them around to find the best arrangement for your piece. This is especially good if you are sprucing up and considering putting in some track lighting but haven’t yet done so. The cost of a cord for a track is about $7.00 – $12.00 so it can be worth it in the long run to have the mobility to try many different things Before you attach the track to the ceiling and hard wire the electrical connection more permanently into your house’s electrical circuitry. So what about washing your glass treasure with light? What are some other ways this can be done? I am a believer in keeping the light source within a reasonable distance from your glass piece. Trying to wash a piece with light from six feet is going to be a lot more effective for modest pieces (under 2.5 feet in height or diameter) then it is from ten feet or further away. However, if you absolutely want your glass piece far away from an available track and installing track lighting is not an option, I would direct you to consider spot lighting. Normally these lights have a very focused beam, but the beam is also very intense and holds its illumination over distance. By using both spots and a few floods, you can get a very good effect for glass lit from a distance. All beams spread a certain degree and the further away, the more diffuse the beam will be. Spots close up, though, might not be useful for anything but small pieces. In some cases, it can even make the piece seem over lit or with hotspots, so you have to adjust for your specific needs and likes. See the first image at the top of the post for an example of hotspots from lighting. They work when they help to add dimension, but they an also quickly become obtrusive, giving a harsh feeling to the work. If you have a piece that is large and will be a centerpiece in a room, consider lighting this kind of piece from multiple directions and being careful to keep the angle of illumination close instead of far in order to eliminate long shadows. In the case such as this, even one strong central light directly above could be just as effective as numerous lights four feet or more from the center of the piece. The larger works such as glass sculpture will most often require lighting that is both directly above, several feet away and then at least ten to twelve feet away in order to get the right range of illumination. Lighting that is above will provide a sense of the work being lit from within, but for sculptural work, you may want to be able to see the surface as well instead of just having a glowing sun of a piece in your large front foyer. Adjusting how much light hits the piece is important, so it may be that a few choice 50 watt lamps close by will do most of the lighting while several smaller lamps further away will help to light up the surface enough so it can be seen in a way that interior or close-up can’t do. If you want to get into perfect lighting of a piece, pay attention to the lighting hot spots on the piece from your lighting. Some of these are nice and helps to give the work dimension. However, if you are lighting a large piece you can wind up in a situation where the piece looks marked by many lamps. In fact, some pieces that have undulating surfaces can be lit rather modestly and yet have many hot spots on them or distracting reflections from the lighting simply due to the way the surfaces will pick up one light source many times. Daylight can’t be beat for a nice broad range of color and contrasts in this piece made last year at the studio. Sometimes, when you are limited in your capacity to put in track lighting for your piece, one thing you can consider is actually keeping the piece in a dimly lit room with one light source on it. I light paperweights and solid work like this all the time, and the effect is remarkably dramatic and effective. A vase on a light box shining light up into it in the right degree of spread, can be amazing. Likewise, you can also light a vase from its center using something as simple as a candle. During Christmas I often will take a large blown clear bowl, fill it with water and place a dozen candles made to float, in the water. The effect? Pure magic! But how much light do you need to throw onto a piece, specifically? Again, it is based on the piece itself and the environment that it is in. You can shoot one spot straight down on the right piece in a dimly lit room and get amazing effects for that piece if it is appropriate, but you see, this is all subject to so many elements that have to all line up, like the planets. But as a very general rule of thumb I find that any piece of glass worth its salt will need anywhere from at least 50 watts worth of light to an upper end of 200 watts. Having said this, there are pieces I light that use seven watts. My gallery at the studio, which is currently only about 300 square feet has over two thousand watts crammed into that room and to be honest, I could use another thousand watts easily. I also have hundreds of pieces in that room, all screaming for light. And yet, the gallery does not feel over-lit. It is bright, yes, but over-lit? Are you kidding? Light is so good with glass. So use these numbers only as a starting point. And one option that I would consider if you want to go the track lighting route are dimmer switches, which will allow you to modulate how much light you put onto a piece as well as to give you options for creating a mood with a piece. Hopefully, armed with these tips, you can make the best of your artglass. If you run into challenges along the way, drop me a line, as I am always happy to lend insight if needed. For those interested in light boxes, I am including a source that has been good for a variety of applications. When searching, search using “LB” and “LBX” as the search term, as this will bring up all of their light boxes! You can also click on “light bases and turntables” in the left hand column. The smallest boxes are four inches in diameter and will have a seven watt bulb, which is good only for small pieces several inches in diameter. However, you can outfit these with a ten watt bulb and this will greatly improve it’s lighting capabilities. Happy lighting! Next Post Money Killed My Parrot!